University Of Sargodha UOS DPT, Pharma D, DHND, DMLS admissions 2019 are now open in which required criteria is F.sc Medical with minimum marks 55% and 60%. 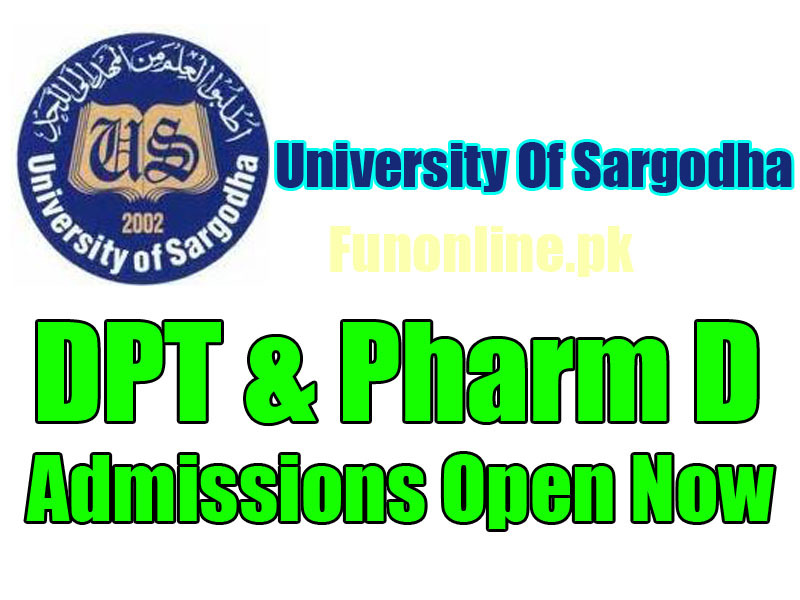 UOS DPT (Doctor Of Physical Therapy) and Pharm D (Doctor Of Pharmacy) admissions 2019 Last date is October 2019 for both departments. UOS medical department admissions 2019 opens on in October 2019 for dpt and pharm d. Doctor of physical therapy is annual based study program of 5 years duration and PharmD is also 5 years study program but pharm D is semester system based. UOS is best for every that student who have wish to study medical education from a university that fulfills their knowledge requirement. UOS is a finest university in Pakistan providing the best quality education to students from all over the world. University opens admission every year and large number of students give entry test conducted by university of Sargodha. This well known university announces merit list and entry test result after they took entry test. Successful candidates list displayed on their official page along with their qualification, Aggregate marks and entry test marks. This year for the Admissions in UOS DPT, PharmD, DHND, DMLS university will took entry test after the deadline of admission cross. UOS DPT merit list 2019 will be updated here after the officials of UOS announce it. UOS pharm D merit list 2019 will also be posted here very soon. If you want then we will provide you with download UOS merit lists 2019 for DPT and Pharm D. Admission of dpt and pharmD eligibility criteria and important date are givne below that you can check here. Also you can check that uos is offering admissions in other medical departments. For PharmD: FSc (Pre-Medical) with minimum of 60% marks or equivalent recognized qualification. For DPT: FSc (Pre-Medical) with minimum of 55% marks or equivalent recognized qualification. Foreign/Overseas candidates who have qualified FSc (Pre-Medical) or equivalent from any country under Pakistani or Foreign Education system, with three science subjects out of which Biology and Chemistry are essential, are eligible to apply for these seats. In case of qualification from any Foreign Education System, IBCC equivalence Certificate will be compulsory. Sign and submit the complete Application Form lo the relevant Department. Upon receiving the Application Form, the Admission Office wit dispatch a hard copy of the Prospectus to each applicant on higher mailing address. Note: Online admission facity is only for main campus and constituent colleges. Note: The merit list of Self Support Program will be displayed after the third merit list of Regular Program. For consideration of admission in more than 01 categories, apply separately in each program. The Regular. Self Support Local and Foreign/Overseas candidates are required to apply to respective College / Department of University of Sargodha directly, alongwith attested copies of all relevant documents. On any of the above dates, if there is a public holiday, the process win be completed on the next date. The vacant Foreign (Ex-patriate) Seats will be filled from the Self Support Local applicants where applicable. As per rules, the vacant seats after 3rd merit list will be filled from the waiting Merit List. Incomplete forms or forms received after due date shall not be entertained and no further correspondence will be done in such cases. All applications must reach the concerned office (Sargodha Medical College / College of Pharmacy UOS / HEC Islamabad) before the closing date, for inclusion in the list. D_pharmacy eligibility in Pak with list of Universities?